Budget PC builders are in for a treat: It’s been officially confirmed that you can now heavily overclock Intel’s cheap Skylake chips with a BIOS update. Tech site TechSpot confirmed it through hands-on tests. 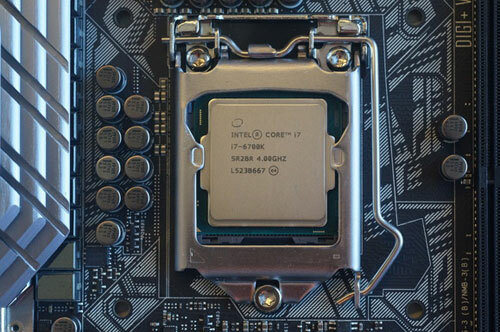 The team overclocked a Skylake Core i3-6100 from its default clockspeed of 3.7GHz to 4.7GHz, after motherboard maker Asrock provided them with a beta BIOS that required switching off the integrated graphics. Why this matters: Intel’s last few generation of chips have limited overclocking to pricier “K”-series CPUs. With an apparent workaround discovered, higher clock speeds and essentially “free performance” may become far more attainable for those who can’t afford a K chip. “Overclocking” is the term for running a CPU’s clockspeed above its rating from the factory. This may sound dangerous—and it can be if done improperly—but many CPUs are artificially limited to lower speeds by Intel at the factory to help meet prices. Here’s a car analogy: It’s like if Ford sold a top-end Mustang that could hit 150 miles per hour, but then took the same car and set its computer to limit the top speed to 120mph. In this case, Intel’s cheapest “K” Skylake chip is the $242 Core i5-6600K with a factory clock speed of 3.5GHz. The same chip has an equivalent Core i5-6500 for $192 at 3.2GHz. If you could take that cheaper CPU and overclock it to the same speed, why buy the pricier part? An architecture change within the sixth-generation chip that separates the chip’s “BCLK” (“base clock”) from other components appears to be the culprit behind the newly enabled overclocking. The base clock is one of the internal clocks that regulates the overall megahertz of the chip. With Haswell or Ivy Bridge, for example, the base clock was hooked up to other sections of the CPU, causing instability when the base clock was increased even in small amounts. That’s no longer the case, and after months of speculation over whether or not base clock overclocking could work, we now know it could. Something to note: TechSpot’s overclocking confirmation was achieved only with the dual-core Core i3 chip. Anandtech’s attempt at performing a base clock overclock of a quad-core Core i5-6500 hit a wall well before TechSpot’s dual-core would. But it isn’t known whether that’s because of the motherboard Anandtech used or because board vendors are still tweaking their BIOSes to enable the overclocking. PCWorld reached out to officials at Intel for comment, but we’ve had no response as of Friday afternoon. However, since the launch of Skylake, Intel has maintained that design changes would make the new chip overclocking-friendly. What’s not clear is whether Intel intended to make the non-premium K-chips overclockable, too. As mainstream desktop PC sales continue to decline, Intel has increasingly relied on sales to enthusiasts and gamers, who have no problem paying a premium for overclocking-friendly chips. If a groundswell of PC builders suddenly reached for the cheaper, overclock-ready chips to save a few bucks, that could impact sales of Intel’s premium K-chips. This wouldn’t be the first time Intel had to squash such a trend. Intel’s chipset for its Haswell series included the Z-series for overclockers alongside the cheaper H- and B-series chipsets. When motherboard vendors discovered a way to enable overclocking on the lower-cost H- and B-series, Intel stopped them by updating the microcode on its CPUs, forcing buyers to move back to the higher-margin motherboards with the Z-series chipset. It’s just as likely that Intel could look the other way. The company has truly been friendlier to overclocking. It has sponsored extreme overclocking contests using liquid nitrogen and liquid helium, and even threw a bone to budget builders with its $72 Pentium G3258 “anniversary edition” in 2014 that was ready for overclocking.